How Are Federal Student Loans Distributed? Students considering a Federal education loan will first need to fill out and submit a Free Application for Federal Student Aid. The FAFSA, and the Student Aid Report it generates, will determine the amount of funds you are eligible to borrow. You can then apply for specific government loans through your college's financial aid department, or through a licensed lending authority. Once your loans have been approved, the money will be disbursed in two different ways, depending on the type of loan you have received. Federal Direct Loans have very strict usage requirements, and the disbursement procedure is heavily regulated. All Direct Loan monies are transferred from the U. S. Treasury to the Department of Education, where all Federal education loans are approved and processed. Once the DOE has processed your loan application, the monies you have been awarded will be sent directly to your college or university usually in multiple payments. Your school's financial aid office will then deduct your tuition, housing costs, and any other fees owed to the college. After all of your college costs have been deducted from the loan amount, the remainder will be disbursed to you by the college itself in the form of a check or electronic deposit. This disbursement process is designed to eliminate any fraud in the student loan process, and to guarantee that Federal loan monies are indeed going to support students actively enrolled in a college or university. These regulations also control how a student spends their financial aid money, ensuring that Federal education loans are used to pay for college costs and not frivolities. Students with extreme financial need often qualify for subsidized Federal education loans. Financial need is determined by the student's income, and the income of the student's family, as compared with the projected costs of a college education. With a subsidized loan, the Federal government pays all accruing interest while the student is enrolled in college. When the student graduates, or leaves school, he or she will only be responsible for the initial loan amount. Unsubsidized student loans are also guaranteed by the Federal government, but all accruing interest is the sole responsibility of the student. When a student leaves school, they will be in debt for all of the original loan amount plus all of the accrued interest. While Federal education loans offer students the choice to defer payment until after graduation, many students with unsubsidized loans choose to make payments toward the accruing loan interest as a way of controlling the amount of debt they will be responsible for when they leave school. 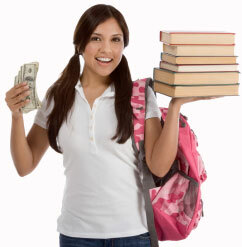 Federal Direct PLUS Loans for Parents are handled in much the same manner as the Direct Loans for students. All approved loans are paid directly to the child's school in multiple installments, and any remaining money will then be disbursed to the parent in the form of a check or electronic deposit. Parents, if they wish, may authorize that the remaining funds be disbursed directly to the student. Direct PLUS Loans for Parents are determined by the applicants credit, and are only available to parents and guardians of students enrolled at least part time at an accredited college or university. Repayment on the PLUS Loan for Parents must begin immediately, and there is no option for government subsidies. All PLUS loans are the sole responsibility of the parent borrower, and failure to meet expected repayment schedules will adversely effect the loan holders credit.